This week we feature a driver whose weekend did not go as well as they had hoped, as it ended up just missing the transfer from the G Feature on Sunday. 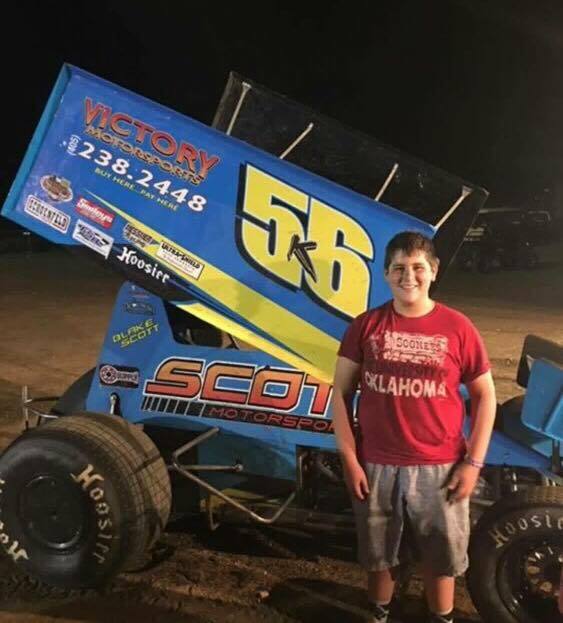 Blake Scott hails from Pauls Valley, Oklahoma and is a 14-year old rookie in the Racesaver class who had the time of his life at the 2016 Racesaver IMCA Sprint Nationals. Q: What was your racing experience before starting up in the Racesaver class? Blake: At 8 I started racing junior sprints in Oklahoma City. At 11 I moved up to the restrictor class and raced that for a few years and even won a track championship last year in 2015. Q: Why did you choose to start out in the Racesavers rather than a 360 or other sprint? Blake: My Dad and Andy Shouse talked and they thought it would be a great class for me to move into. The cost of racing seemed to be cheaper than running in the micros. Q: What tracks did you race at this year? Blake: We raced most of the Sprint Series of Oklahoma tracks, several in Texas and then Eagle Raceway. Q: Having raced a year in the Racesavers, what do you think of the class? Blake: I think it’s a great class to race in that isn’t going to break my Dad racing (laughs). The cars are very even, so I don’t have to worry about being out-motored, just out-driven. I like the super-strict rules; they keep the fields even and the costs down. Q: Did you enjoy your first visit to the Racesaver Nationals? Blake: It was AWESOME!! Eagle Raceway is my favorite of the tracks that I raced at. It’s a super-nice place with great fans. I can’t wait to go back next year and for years to come! Q: What was the best part of your experience? Blake: The best part was, being so young, at 14 most of the other drivers couldn’t believe that I was the driver! And after the races, all of the fans wanted my Dad’s autograph (laughs again)! They couldn’t believe I was the driver either. Q: What was it like racing against teams from all over the country? Blake: For me, it helped a lot. Most tracks have a few fast guys, but up here at the Nationals, everyone is fast so you better be on your game. Q: Where did you finish on Sunday? Blake: Well; our weekend was up and down. We didn’t make it out of the G Feature Friday, and blew a motor on Saturday. That had us starting way in the back Sunday. We didn’t get the results we wanted, but, we left Eagle with me getting some good racing experience and making some good laps. I definitely hope to be back and race at Eagle Raceway for several years to come.